Feed an entire flock of birds at once while keeping plastic out of landfills with the Songbird Essentials Green Recycled Plastic Fly Through Bird Feeder. Adding this durable and reliable unit to your backyard will surely entice birds to visit, and its generous platform can accommodate several different types of feed. 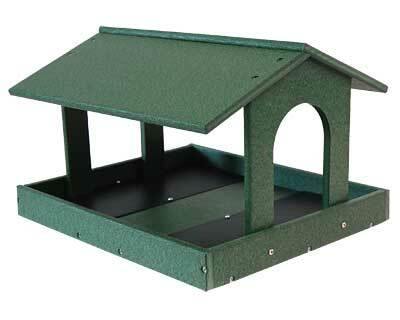 The recycled plastic frame forms a lasting item, and its dark green tone enhances your backyard. The significant, base platform holds up to 3 quarts of mixed seed, along with fruit, mealworms, or suet cakes, while steel screening here provides plenty of drainage. A 6" wide, plastic slat across the base of the feeder allows you to pole or post mount the item, for a fantastic display in your garden. Uprights on two sides support the generous, pitched roof, protecting seed from the elements and creating the familiar, fly through design. Not only does the recycled plastic body ensure a durable item, it is also easy to clean and disinfect, and the 1.75" tall lip around the unit offers perching for songbirds. Enjoy feeding several birds all their favorite foods at once in this Green Recycled Plastic Fly Through Bird Feeder. Lifetime guarantee. Made in the USA.